Summer break is drawing near, and during these last couple of weeks, I inevitably get asked the question by a smattering of parents: "Do you have any suggestions to get Billy to read this summer?" When I'm talking with parents about encouraging their child to read over the summer, I try to be thoughtful about my suggestions, especially since I've just spent an entire school year with their child. So I use what I've learned about their little Billy, what I know about their family situation, and I give a few practical, specific ideas for them to try. 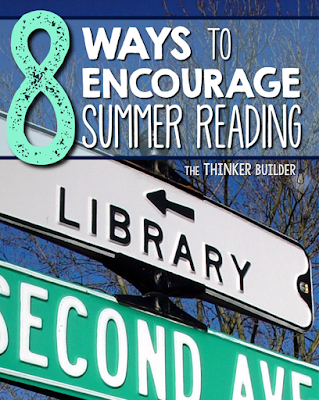 Here are eight suggestions I've made to parents to help encourage summer reading. One of my very favorite things about reading is looking forward to the next book by my favorite author. Try finding a new favorite, either an author or series, to not only read, but to look forward to reading. Here is a 2nd-3rd grade list and a 3rd-5th grade list of popular series if you need a starting place. Or here is a list geared to boys and one for girls. Sometimes where you read makes a big difference in wanting to read. Try finding a new little nook in your home: under the dining room table, in the closet with a flashlight, in a tent in the backyard, in a huge cardboard box (a personal favorite). More and more books are getting turned into movies. Take advantage by planning a movie night after finishing the book. Don't forget to also take advantage of the opportunities to compare and contrast the movie with the book. I often try to remind parents that summer reading doesn't just have to stop at books. Try to be more intentional about getting your child reading alternative types of text: the menu when out to dinner, the instruction manual to the new lawnmower, the lyrics to the new Taylor Swift song, the strategy guide to a video game. One way to encourage a child to extend their reading choices into some other genres is to start with a really good piece of historical fiction. (Here is a list of novels and a list of picture books if you need a starting place.) During or after reading, dig into some research of informational texts about the time period surrounding the book. Use an old board game like "Sorry" or "Candyland" and work your way around the board based on the books read: move one space per chapter, or one space per picture book. Blow up a pile of balloons and let your child pop one after each book read. Start a necklace and add a bead or a charm for each finished book. 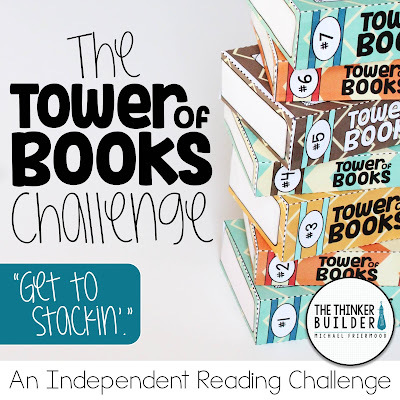 Use my "Tower of Books Challenge," where kids build 3D books out of paper templates for each book they read, and then stack them to reach different incentive levels. Check it out HERE. Some kids don't need incentives to read. But if it helps, I like to suggest using incentives that involve activities and privileges, rather than always a prize. It's important to start with a small goal that can be easily reached (e.g. 3 days in a row reading 20 minutes), especially for reluctant readers. Early success helps get the snowball rolling downhill. Then you can work towards larger goals and incentives. Combining incentives with a creative tracking system can work really well! You might try something like: Choice of movie for family movie night, choice of homemade dinner or restaurant, library date or coffee/hot chocolate date with Mom or Dad, stay up late for an extra hour, have a sleep-over with a friend. Don't forget that your local public library usually offers a summer reading program to get involved in too! That's always an easy suggestion to parents. What did I miss? What other suggestions do you like to offer parents to help encourage lots of summer reading?